Whether you have a small back patio or a huge backyard, your outdoor space doesn’t have to be plain and boring. A vinyl fence, deck, or shade structure from Future Outdoors® can help you turn the outside of your home into a functional and beautiful outdoor living space. Here are a few tips and ideas for making any outdoor area into a new outdoor room. Just like with a room inside your house, an outdoor room or living space needs to have a good “flow.” You can’t just put up a shade structure and set some furniture down and have a functional space. Consider the entrances and exits to the space, any paths or walkways, and your own ideas for what you want the area to be – for instance, a dining room, a conversation space, or a comfortable lounge. You can also add additional elements like planters, shrubbery, or deck rails to change the flow and create a more cohesive space. It’s important to have an idea of what kind of room you want to make – after all, you wouldn’t confuse a living room and dining room inside your house, even when they don’t have any furniture or decoration. When you’re creating an outdoor space, try to design it so that it naturally fits your goal. If you want a space to encourage conversation, keep it close and intimate. If you want a space for food or lounging around, give it some extra breathing room and plenty of places to serve or cook. A fireplace, fire pit, or outdoor chimney is a great addition to almost any outdoor living space. Fireplaces and fire pits can encourage conversation and make your outdoor space usable through the fall and spring (and even the milder parts of winter). Also, make sure that your fireplace or fire pit conforms to Dallas-area regulations by calling your local fire department or checking your town’s building codes. Depending on the type of outdoor space you want, you’ll need to find or invest in a variety of seating options. An outdoor dining area might use chairs or benches, but a conversation area or lounge might do well with sun chairs, stools, or even a sofa or bench built into your deck or patio. More seating options will also make your space more flexible and livable, which will encourage you and your guests to use it more. While it can be nice to feel the sun on your face, trying to read a book outside or enjoy a quiet conversation while the sun shines in your eyes isn’t our idea of relaxing. A shade structure such as a vinyl pergola or gazebo is a great way to keep the sun at bay without restricting your view or blocking your space in too much. Plus, these shade structures can be a great way to “zone” your outdoor space, creating separate areas with their own feel and function. If you have a large sliding door or double door that leads to your backyard, you can easily use that as a starting point for incorporating your indoor and outdoor spaces together in one cohesive arrangement. You’ll be more likely to use your outdoor space if it’s easy to get to, after all. The last thing you’ll want to do after setting up an outdoor living room or dining room is take it all apart again just to clean and stain the wood. However, if you don’t take care of your outdoor living area, you won’t have it for very long. 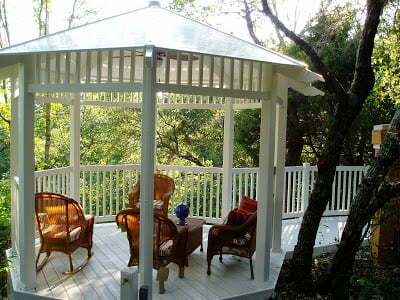 A better option is to construct your deck, fence, or shade structures from long-lasting vinyl. This will allow you to use your outdoor space for years without needing to worry about expensive and time-consuming maintenance – not to mention avoiding rot, pests, and ugly warping and fading. Future Outdoors® is the leading vinyl fence expert in the Dallas-Fort Worth area. We’ve installed hundreds of miles of vinyl fence and more vinyl shade structures than we can count, and we’ll bring our expertise and amazing products to your home with just one call. Call us at (972) 576-1600 to arrange your free quote for a new vinyl fence or vinyl shade structure, or visit our Facebook and Google+ pages for more tips on creating beautiful outdoor spaces.